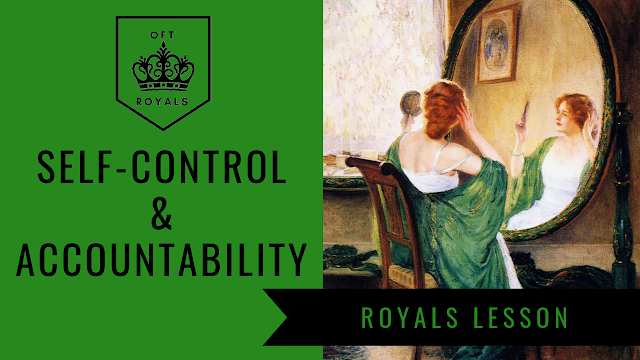 Self-Control and Accountability – Royals Lesson! - Making yourself go to classes/school/work. - Making yourself keep your room clean. - Making yourself do your homework. - Making yourself stick to an exercise routine. - Making yourself go to bed at a reasonable hour. - Making yourself eat healthy foods. Do you see the connection? You must MAKE YOURSELF (Self-Control) do the things that you NEED TO DO (things you are accountable for). Now, it can be quite hard to hold oneself accountable for one’s actions, but it is not impossible. It’s a big life lesson, one that, while it’s best learned from experience, can still be understood from the teachings of, well, me. I hope I can be of help in this endeavor. - Remind yourself what’s at stake. Whether this means making yourself go to class because you remind yourself “I could fail!”, or making yourself go to bed at a reasonable hour because otherwise “I’ll be exhausted all day tomorrow!”. Whatever this means for you, remind yourself what you have to lose. - On the other side of the coin, remind yourself what you have to gain. This could mean making yourself keep your room clean because you want to be able to have a friend over, or maybe making yourself go to class because you want to learn, or just simply know that going to class will help you understand the material better. - Set goals, then break down those goals into timelines. Nothing comes easily, and nothing comes instantly. But you can make it easier to hold yourself accountable by setting obtainable goals/timelines. Setting goals that you can reach, and want to reach, will help you become motivated. Need to study more? Set yourself a grade goal on your next assignment. Say that you wish to earn an A. Then, set up a timeline. How will you achieve this goal? For the assignment example, maybe this means working on it every night for 2 hours, until the assignment is due. - Hold yourself accountable in multiple ways. Set alarms reminding you to do homework. Tell your friends “Hey, I’m going to study at 6 PM.” (Telling someone else what you plan to do, will make you more likely to do it.) Mark on your calendar when things are due. Invite a friend over for next week to force yourself to clean your room this week. Holding yourself accountable in more ways than just yourself will keep you on track. - Motivation music! Do you keep finding yourself easily distracted when doing schoolwork, chores, or other less-than-desirable tasks that need to get done? Listening to a video game soundtrack helps to motivate you and keeps you focused, as usually there are no lyrics. Classical music can also help. While all these tips can help you to achieve your goals and become self-reliant, it really comes down to you. How much do YOU want to achieve your goals? How much do YOU care about your life? And that is something that can’t be taught. That’s called drive, passion, ambition. All of those things which I know that you have. So get out there and show the world your spirit. 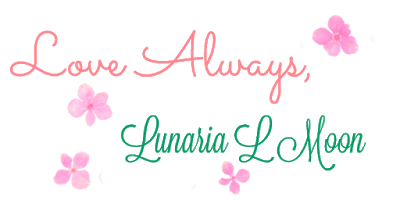 Thanks for reading, remember to stay amazing, and I’ll see you in my next post! This is some real good information. I enjoyed reading this article! Keep up the good work! NC Comicon (Durham) 2018 - My Experience!